Hi, friends . . .
My name is Jery, and I’m planning a one-week vacation to Tokyo in March with my family. It would be our first visit to Japan ever! We live in Jakarta, Indonesia. Obviously, since we live in hot, tropical climate, we are hoping to find snow during our visit to Japan. We plan to visit Fujiten Snow Resort, and we’ve all prepared ourselves (at least, we tried to think what to prepare) to face the cold weather: Jackets, gloves, even earmuffs, and a bunch of warm clothes. For food, we’re really excited to finally be able to eat Japanese food in Japan! Ramen, tsukemen, sushi, okonomiyaki . . . just can’t wait to visit the places recommended by TokyoCheapo! Personally, I want to visit the Ghibli Museum, the Gundam Base, the Shibuya Crossing, the Godzilla head, and the arcade building in Akihabara. I vow to visit these places, and I’d consider my visit to Japan completed. I’m still rigorously researching about traveling to Tokyo, including here on TokyoCheapo. Really hope to learn much from here. Hi. My name is Bob. I lived in Tokyo for 20 years, mostly in the Shibuya area, and foolishly moved back to Minnesota a year ago. I still make it back to Japan frequently. My top tips for newbies: Learn Japanese, Get a bicycle (fastest way around town), Try to eat everything at least once, and maintain your sanity by getting out of town occasionally. Regarding this last point, I just wrote a book called Hikes with Hot Springs–Day Trips from Tokyo. Check it out! 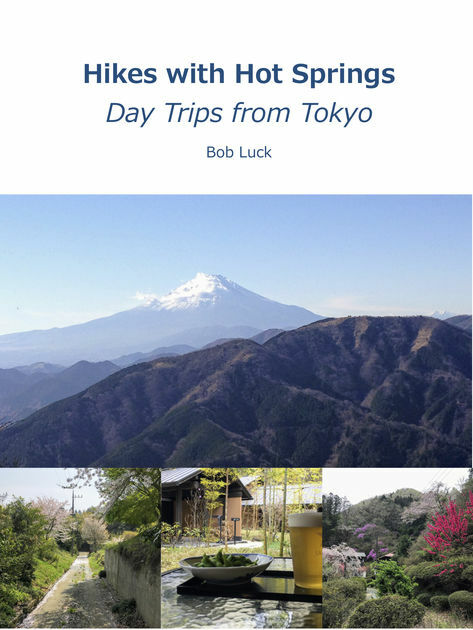 Read a free sample or buy Hikes with Hot Springs--Day Trips from Tokyo by Robert Luck. You can read this book with Apple Books on your iPhone, iPad, iPod touch, or Mac. Hi my name is Peter. I live in Toritsudaigaku and have been in Tokyo around three years. Moved to Tokyo to teach design tech at one of the international schools. For fun I play in a band with a few friends, podcast about craft beer and eat out a lot! Tip for newbies? Just get outside the Yamamoto line, Tokyo is huge and you’ll learn more about what it’s like to be a Tokyo-ite (is that a word?) than if you stick to the tourist areas. Hi I’m Mark…I was a frequent visitor to Tokyo since 1974 thru 2006. I was a navigator with the USAF flying into Yokota and Atsugi. Later I worked for a large telecommunications company with contracts supporting Yokosuka, Camp Zama and many sites in Japan. My first visit to the Zama area was in Cherry Blossom time and fell in love with the seson. I am returning with my wife at Cherry Blossom time next week. Love this site for the interesting ideas for food, fashion and fun in Tokyo. I’m living in Nottingham UK at the moment but love to travel, especially to Japan. I’m currently working in the IT field doing computer builds and repairs etc. I have been to Japan twice before and have a trip planned for very late October and most of November 2019. I’m staying near Machida City in a small apartment. I’m really looking forward to Halloween in Shibuya and the Rugby World Cup final in Yokohama. Tokyo Cheapo is a great resource for me as I’m not wealthy and have to watch the spending, especially on holiday as I tend to go crazy! Love the Youtube videos and the site, also the ebook I bought from you last year was a great help. Hope to chat with some of the great members and staff here at some point. I live south of Yokohama, but before this lived in Tokyo. I have lived all over Tokyo, actually - Shinjuku, Ichigaya, Meguro, Shinagawa, Machida… I guess I like to move? LOL. I’ve been in Japan 26 looooong years. Why did I come to Japan? Honestly, I have forgotten. Craft beer is a hobby and a lifestyle, LOL. If you want to know about craft beer in Yokohama or Tokyo, hit me up. Cooking, being vegetarian means learning how to cook! I am recently getting into Middle Eastern food, e.g., Lebanese. Love it, but very hard to find some of the ingredients here. If anyone knows a good market, for Indian, Middle Eastern, etc. food, let me know! I love cats! I have two of the little beasts and I love buying treats and toys for them. I also collect maneki neko. There are so many interesting versions of those little statues! Love the beach, taking long walks, and doing picnics. Hanami season is THE BEST. I make really good takoyaki. Tip for newbies, who travel here or live here? For travelers I would always say “get the rail pass!” because I wish I could have one as I really love traveling but the shinkansen is so damn expensive and the bus is so damn uncomfortable. It’s an amazing bargain if you plan to go outside Tokyo. And while everyone goes to Kyoto, I highly recommend going to Kanazawa, if you have time. It’s called “little Kyoto” for a good reason, and is far less crowded. If you do go to Kyoto, remember - the temples open really early and if you arrive at 7am you’ll be the only person there. That’s what I always do. For people who live here, I’m not sure what to recommend since everyone is different. But one thing I will recommend is to learn some Japanese. It really does help a lot, and even though you CAN get by without it, you will have a much better experience if you at least learn basic conversation. Natto… not really. It’s not terrible but it’s also not something I eat very often. I think a better question is, “Do you like shiokara?” because I have yet to meet a foreigner who does! My name is Tina, i came from Malaysia. Currently i married with a japanese man and living in Tokyo. After moved to japan, everything is so new to me. I couldn’t speak japanese yet but somehow i can understand a little bit. My profession is Graphic Designer, but i resiged because of my husband. And started my new life in tokyo. I love coffee culture. My wife and I are planning to visit Japan April 17th for around a week. We are considering to buy a Skyliner ticket from Narita Airport to Ueno which includes a 72 hour Metro pass. Is this better value for money than buying a Sklyliner ticket and then using a Suico or Pasmo card? Also, we are planning to visit Kyoto afterwards for 3 days and then Osaka for a day afterward. Does anyone have any recommendations about which rail tickets we should go for and the best way of getting around? Hi, I am AD. I live in Australia and this will be my and my partners first visit to Japan. I am very confused with the no of options of transport and different passes. I will be there in May and this is how we plan our itinerary. I am very flexible with any amendments. If I am missed out something or need to skip something , please let me know . More importantly which pass should I buy or should I not buy JR pass in advance and just the regional pass will work. Look forward to your valuable advice. 2019 April 16th 21:00 Y-ran-karapte-e ! Hello in Ainu ! Call me Andyy, I wanted to unlock my iPhone and tokyocheapo was top page on Google and then …Thanks a lot I pay 10,000 for iPhone AU robbers they keep delaying my end of contract until 2019 oct . I live in Sendai 30 years and was pillaged ! Not seen kid 15 years I have been on social 2007 and not been home since Tsunami, last few years work partime gardener , and self study Ainu. I want to go home but the social do not allow , and can not save money ,?like a Swedish prison ! Live in a flat with no hot water or fridge because of 15 ampare. Fed up with this life here ! I had a pop up that offer help with travel , got the feeling that somebody knows what my intention is in the future , so it makes me wonder if this site is being read by outsiders , for example my internet speed is always slow 1G plan 200 mb up load 20 mb download. Safari crashing and Ookla speed test , server locked to Allied server Misawa base ( I am UK not US ) so keep fighting any tracking pop ups and spam , linked to my kids being abducted and the case of Jutakusagi victim of housing fraud. In my 30 years experience in Japan 6 or 2x3’s meaning what you save on the swings you lose on the slide they look different but the same , they use different names meaning the same thing , buses are cheaper ,once you arrive in the mega city you will get lost! I live in Sendai Tsunami earthquake zone and try to avoid going south ,you will be confused to travel in that region because of spaghetti route ! If I advise to come to Japan , then go direct to Hokkaido , I travel by bicycle in Tohoku , once went to Hakone very nice in Summer but Around Tokyo is a trap and tiresome, ,expensive, you will not see any savings ,pot luck !